Located at the north-east corner of West Edmonton Mall beside Sears, the Cactus Club Café is one of Edmonton’s newer restaurants, opened in April, 2009. 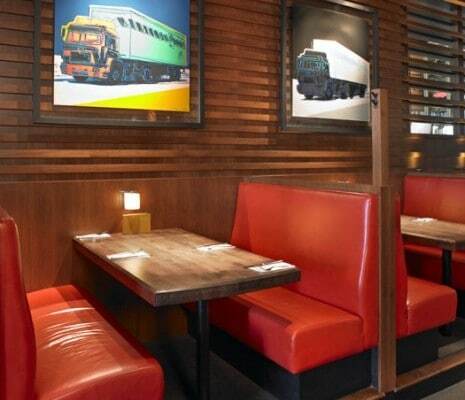 It is part of a chain of restaurants founded in 1988 in North Vancouver by Richard Jaffrey and a partner. There are now 17 restaurants in B.C. and 3 in Alberta. Their goal is to offer a fun, upscale restaurant with great food, wine pairing, and friendly service, in a relaxed, unpretentious atmosphere. The culinary vision is led by Canada’s only Iron Chef, Rob Feenie, who defeated Japanese Iron Chef Masaharu Morimoto on Iron Chef America. “Chef Feenie’s dishes are clean and simple in construction, allowing premium ingredients to take the lead role.” The menu is set by a test kitchen team of over 20 Red Seal Chefs and over 50 apprentices, led by Chef Rob Feenie. The focus is on fresh, local and unprocessed ingredients of high quality and on finding unique ways to prepare classic dishes. The Master Wine List has been drawn up by Sam Zavari, Bar Operations Manager and Wine Director, with wines chosen that are unique and not easily accessible alongside well-known, familiar brands. B.C. wines make up over 30 % of the list, and in some locations, notably Kelowna, even higher. The wines are listed by varietal from Sparkling, through Whites and Reds to Dessert, with B.C. wines always first on the list in each section. I visited the Edmonton Cactus Club Café recently for dinner with three companions. Our first impression was of an elegant but comfortable atmosphere, warm and inviting. Our server was friendly and helpful, making suggestions when we hesitated about menu choices. She was knowledgeable about the wines and wine service and made sure that we felt well taken care of throughout the evening. We discovered that Jeff, the chef at this restaurant, is the Executive Chef for Cactus Club Café in Alberta, responsible for hiring and training the kitchen staff of 45 in Edmonton and that of 60 at the two Calgary locations. The food for the restaurants is purchased through contracts with suppliers and the emphasis is on quality: AAA Alberta Angus beef, farmed salmon in B.C. with strict environmental controls, even to the extent of having divers go into the tanks at night to clean and ensure quality control. Ted, the manager on duty that night, told us that with only word of mouth advertising, the restaurant is busy 7 nights a week. Ted is responsible for wine service training and the focus is on customer satisfaction and wine knowledge for the service staff of 109. He and Sam are now working on a Reserve Wine List for customers who are looking for an extra special bottle. Now for dinner and the review: we found that the Cactus Club Café now has a gluten-free menu for customers with celiac disease. After some discussion and with advice from our server we each chose a different item – the 4 mushroom steak, Hunter chicken, cedar-planked salmon (on its own mini plank), and the Jambalaya rice bowl (gluten-free). The food presentation was excellent and appetizing, the food itself cooked to perfection and delicious, and the wines matched the food perfectly, bringing out the best in both. Our overall impression was that the team certainly lived up to their motto “We strive to ensure that every customer leaves happy.” We not only left happy, but we definitely will go back and will recommend the Cactus Club Café to others as a place to go for a relaxing evening with delicious food, great wine and excellent service. Wine Picks: My wine picks this week are all available at Cactus Club Cafe. Pale lemon yellow in colour, this wine has floral aromas mingled with apple and pear. Easy to drink, it has apple and pear flavours and a soft, smooth finish. A great wine to have with seafood and chicken. This wine is dark red with aromas of plum, cherry and a hint of smoke. The flavours are cherry, plum, and spice and the finish is long and smooth. A good match with grilled meats, such as burgers and steaks. This is a unique blend of 8 varietals with Syrah being the backbone of the wine, supported by Merlot, Cabernet Sauvignon, Cabernet Franc, Zinfandel, Viognier, Grenache, and Mourvedre. All of these grapes have been blended to make a dark, delicious wine with spicy, fruity, green pepper aromas. The flavours are of dark fruit, spice, and just a hint of earthiness and pepper. This wine is an excellent partner for steak, prime rib, and any grilled red meat.